As we head into August, travel plans for many people are ramping up. The Life of Luxury wants to share some great “hidden gem” summer rooftops around the world. These are perfect for spending your summer days and nights, escaping the city bustle. In addition, ideal for beating that mid-summer heat. Whether one is jet-setting to Europe or staying local this summer, we have a travel tip for you. The best and often most convenient escape from the relentless summer sun in any city can be found just an elevator ride away to a hotel rooftop. A good rooftop often leads to an overcrowded gaggle of happy hour-goers. As a result, you might endure more stress than sublime. To help guide you, below we have outlined some great under-the-radar spots from boutique hotels around the world. The summer rooftops are perfect way to enjoy a cocktail or two in serenity. But also just far in enough from the city crowds and noise. The suggested list includes a little preview of O:live Boutique Hotel (www.OliveBoutiqueHotel.com), a 15-room design hotel in the fashionable Condado area of San Juan. Scenic summer rooftops across the globe from chic design hotels in Barcelona, Austin, San Juan and Washington D.C. offer the ultimte escape from bustling city life. It’s time you enjoy a VIP experience. Where do you want to go on your next luxury vacation? There is nothing quite as simultaneously serene and exhilarating as the sight of elevator doors opening to a scenic urban rooftop in the summertime. It’s easy for one to feel somewhat claustrophobic surrounded by concrete structures in a bustling city during the hot months. Therefore spend an evening at a rooftop bar taking in the views from above offers a perfect temporary and much needed escape. Relaxing summer rooftops are the ideal way to enjoy city life during the warmer months. As temperatures continue to climb into August, we’ve rounded up some of our favorite under-the-radar summer rooftops. These awesome travel destinations are found across the globe. They are truly the perfect respite from cosmopolitan hustle & bustle. Whether perched above the intricate Gaudi-esque buildings of Barcelona, or the sailboat-lined Wharf in D.C., these hotel rooftops and terraces are the summer’s most unique high-up havens. O:live Boutique Hotel is crowned by its popular Rooftop Club, featuring a full bar, pool, and plush lounge areas overlooking the enchanting lagoon of San Juan. The intimate 15-room hotel comes alive after dusk on this charming Mediterranean-inspired rooftop; a lightbulb-strung oasis nestled low between the sleek high-rise buildings of fashionable Condado. The rare perch allows visitors and locals alike to take in unbeatable views across the water to the sparkling city with rum in hand. Rustic yet sophisticated, The Rooftop Club is designed keeping with the eclectic European inspiration of the hotel. It has been named Best Designed Boutique Hotel by the Boutique Hotel Awards in London. O:live Boutique Hotel is a beautiful boutique design hotel in San Juan, Puerto Rico. Found in the lively Condado region of the city, just steps to the beach. The luxury hotel features an amazing dining and beautiful rooftop lounge. Inspired by European romanticism and the Mediterranean “la dolce vita”, this 15-room design hotel has earned numerous design awards. For example, named a part of the Small Luxury Hotels of the World network. Whiskey Charlie – Canopy by Hilton at the Wharf, D.C.
An expansive terrace with panoramic views over the Potomac River and historic skyline of Washington, D.C., Whiskey Charlie offers a premium destination rooftop cocktail bar and lounge. It sits atop the recently opened Canopy by Hilton at the Wharf D.C. Ten floors up, the 2,200-square-foot space, designed by interior design firm Krause Sawyer. This luxury space features an outdoor roof terrace with seating coves, fire pits and large planters. The glass-enclosed interior lounge boasts reclaimed wood, porcelain and metallic tiles to create an intimate bar with panoramic views from Rosslyn to National Harbor. Given its location and Krause Sawyer’s modern design, Whiskey Charlie is the perfect meeting place. Therefore enjoy all that the newly developed Wharf district has to offer. New York-based luxury hospitality design firm Krause Sawyer unveiled its latest project. The conceptualizing is the first ever North American Canopy by Hilton, Hilton’s (NYSE: HLT) lifestyle hotel brand, from the ground up, in Washington, D.C. this past fall. A sparkling new multi-use riverside development encompassing hotels, retail, restaurants, and leisure activities. In addition to its crowning rooftop lounge, the 175-room Canopy by Hilton features stunning multi-use public spaces. In addition, the Canopy Central café and bar, Transfer Lounge, guest Retreat with an outdoor garden, guestrooms and suites. Even the expansive corridors embody Krause Sawyer’s signature natural luxury design sensibility. With barbeque smoke and the hoppy aroma of locally brewed beer in the air, the second-floor courtyard terrace of the Heywood Hotel feels like your own personal neighborhood hangout. All with a chic twist. It is no surprise being tucked in a picturesque East Austin neighborhood. 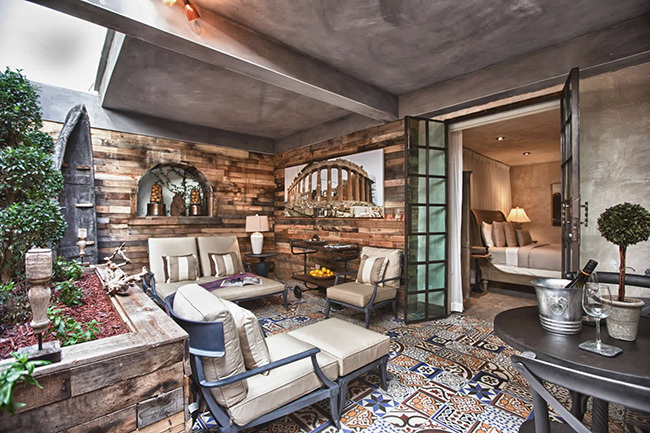 This 1920’s bungalow turned boutique hotel exudes southern comfort from the outside in. Maintaining the hotel’s warm architectural minimalism, the concrete and whitewashed open-air space features intimate seating areas beneath strings of exposed bulb lights. Following in their ethos of community, Heywood’s public spaces are organized around creating connections. They offer a welcoming environment for guests to gather to relax, socialize, or hold coffee-table style meetings. The Heywood Hotel is a luxury boutique hotel located in Austin, Texas, featuring one of the most unique boutique experiences in North America. Opened in 2012 by local Austin couple Kathy Setzer and George Reynolds, the woman-owned and -operated property has an architecturally stunning design. Also, the property is home to seven “lucky” suites throughout 3,200 square feet. The Heywood Hotel is housed in a 1925 craftsman bungalow in the diverse East Austin neighborhood. The team’s dedication to handcrafted hospitality offers visitors a hyper-local, authentic experience accented with a “scale of one” mentality. They strive to anticipate guests’ every need so that each patron feels as if they’re staying amongst friends. Situated atop the 1906 masterpiece by Pere Falqués, El Palauet’s rooftop terrace offers the utmost privacy. There you can lounge beneath an open greenhouse frame entangled by climbing vines, and flanked by lush palms and cacti. These separate you from the sun-soaked expanse of Catalonian rooftops. Featuring a wooden Finnish sauna, massage tables, treatment rooms, a solarium for taking in the soothing Spanish sun. Try an outdoor salt-water Jacuzzi replete with hydro-massage beds. Guests of the hotel can enjoy the utmost peace and tranquility atop this “Little Palace” (Catalan translation for “El Palauet”). If the spa services aren’t enough, the rooftop bar (open until 10:30pm) has a curated selection of Spanish wines, beers, cocktails, and soft drinks. These are accompanied by traditional Spanish snacks. Typically a private guests-only luxury, this exclusive rooftop opens to the public Thursday evenings from 6pm-10pm for #AfterworkEP. Enjoy a lively and glamorous gathering featuring cocktails, cava, live music and unbeatable sunset views over the Passeig de Gracia. El Palauet Living is a luxury boutique hotel situated along the sprawling Passeig de Gracia. Located amidst the Modernisme (the sumptuous Catalan version of Art Nouveau) architecture of Barcelona’s Gracia neighborhood. Opened in 2011 by a native Catalan family, El Palauet (or “Little Palace” in Catalan) was designed and built in 1906 by renowned architect Pere Falqués. He also designed the ornate benches and streetlights that line the 42m wide Boulevard. The all-suite hotel features six large 1600 square foot apartment suites. Offering the comfort, feeling, and familiarity of home with highly personalized guest services and on-call personal assistants. Rooms start at 499Euro / $560 USD per night during the low season (August, November – March) and up to 2900Euro / $3,300 per night in the high season (April – October). Are you ready to enjoy a vacation getaway and visit one of the above summer rooftops? We though so 🙂 It will be a vacation yu will never forget. Contact us today to book your next luxury vacation. Summer rooftops are all the rage, so don’t miss out on ths awesome VIP experience. Return soon to follow this lxuury blog. Read the best lxuury travel news. ← Heesen Yachts Delivers First Yacht in New 50 Metre Steel Class: Omaha!